Campbell Scientific provides professional- and research-grade measurement systems for many applications within agriculture and plant-related markets. Our systems measure environmental parameters related to evapotranspiration, plant growth and development, and disease modeling. This data is useful for scheduling planting, irrigation, and harvesting; supporting automated weather alerts; and timing for pesticide applications. We offer a variety of products that can be used to create systems for Agriculture & Plants. Many of the major components used to create these systems are listed below. Please let us know if we can help you configure a system. 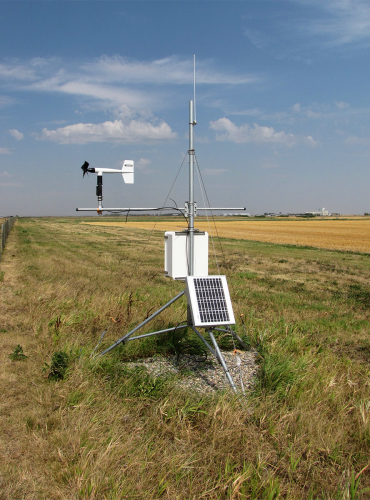 Our weather stations provide long-term, stand-alone monitoring of meteorological parameters for all types of agricultural research applications. Programmable dataloggers allow multiple options for station configuration, measurement and output intervals, and data retrieval. Almost any meteorological sensor can be used including: wind speed, wind direction, solar radiation, air temperature, water temperature, soil temperature, relative humidity, dew point, precipitation, leaf wetness, and barometric pressure. Wind vector, vapor pressure, histogram, and sample on maxima or minima are standard in the datalogger instruction sets. Data are typically viewed and stored in the units of your choice (e.g., wind speed in kph, m/s, mph, knots). All of our measurement systems are based around programmable dataloggers that measure the sensors, then process or store the data. We designed our dataloggers to allow a high degree of flexibility. Measurement types, scan rates, and recording intervals are all programmable. On-board processing instruction sets contain programmed algorithms that process measurements and output results in the desired units of measure. Our dataloggers can also control external devices, such as valves and samplers. Our systems can be configured to provide accurate, stand-alone monitoring of greenhouse or growth chamber conditions for use in agricultural and plant physiology research applications. Programmable dataloggers allow multiple options for system configuration, measurement and output intervals, and data retrieval. A variety of sensors can be used including: solar radiation, temperature (air, water, soil), relative humidity, dew point, leaf wetness, and barometric pressure. Data are typically viewed and stored in the units of your choice. In addition, the system can easily be configured to monitor electrical power or water usage to provide data on consumption. The system can also be programmed to sound audible alerts or call out via voice synthesized modem if alarm-level conditions are reached.